On the evening of April 30th, mysterious creatures can be seen emerging from the darkness and dancing about Calton Hill. Painted bodies cavort to a chorus of beating drums, and breath-taking fire displays memorise astonished spectators. An ancient Iron Age Celtic ritual and one of four Gaelic seasonal festivals, Beltane celebrates the end of winter and the birth of summer. 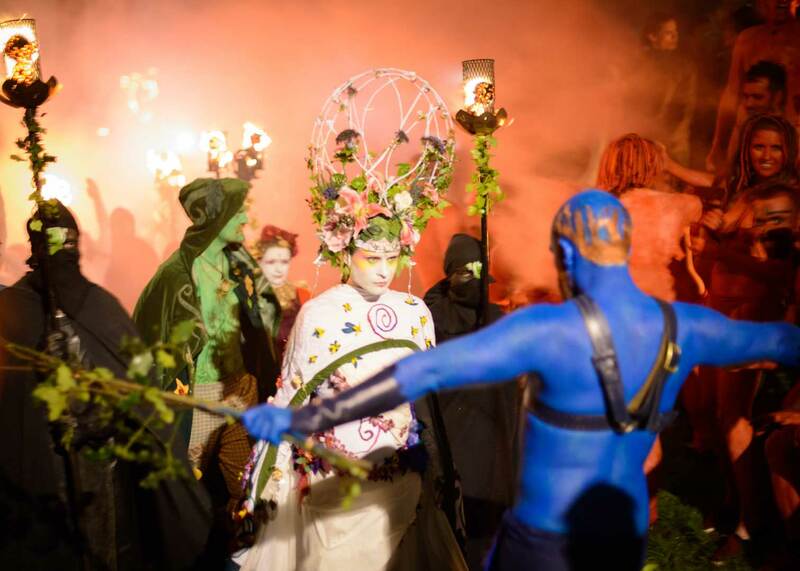 Edinburgh’s Beltane Fire Festival is a modernisation of these customs, still sharing the same core principles; to connect with nature and honour the fertility of the land. Run by registered charity Beltane Fire Society, the event began as a small gathering of enthusiasts. With popularity growing immensely over the years, the festival now involves over 300 volunteers with tickets often selling out. Gates open at 8pm, and performers lead a dramatic procession around Calton Hill that starts at the National Monument (also known as the Acropolis), and begins around sundown. The audience learn of the Beltane story, meeting enchanting characters such the May Queen and the Green Man, and watch their fate unfold as they encounter other wild and mystical beings along the way. Fire plays a big hand in the festivities, symbolling purity and rebirth, and characters perform magnificent fire displays throughout the journey. A huge bonfire is lit by the May Queen and the Green Man, a beautiful and striking metaphor for the start of summer and the joy that it brings. Don’t let the burning fires and brave, bare-skinned performers fool you, atop the hill temperatures are likely to be biting cold, so be sure to wrap up warm. Due to massive turnout, celebrations can also be a little hectic, so parental discretion is advised when deciding whether to bring young children. As Beltane Fire Festival is a community event, each year new volunteers will join and bring with them fresh influences and ideas. While the core narrative of each performance will largely remain the same from year to year, they’ll also incorporate new elements that come about through mutual respect and passion between community members. Each person involved in the celebration works incredibly hard to ensure that the true spirit of Beltane is shared with the audience. The final outcome is a real labour of love, and everyone’s efforts can be seen from the quality of the performances down to the detail of the costumes. Tickets for Beltane Fire Festival can be purchased online, over the phone or picked up in person from Tickets Scotland. While tickets can be purchased upon arrival, this is dependent on remaining capacity and as the event tends to sell out quickly, it’s advisable to purchase them in advance to avoid disappointment. For more information call Tickets Scotland on +44 (0) 131 220 3234.